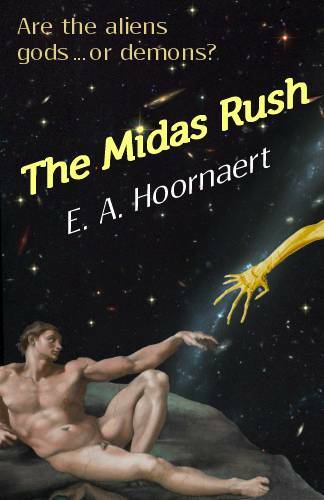 Click here to read a sample of The Midas Rush. In designing the cover, I wanted to build on the brand I established for The Trial of Tompa Lee–a space background, a short blurb, and a large, eye-catching central image. I chose the Sistine Chapel (how highfalutin can you get? 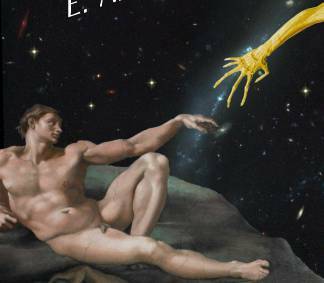 ), but instead of God’s arm stretching toward Adam to infuse him with life, it’s the arm of a golden alien. I wanted a dynamic, well integrated image, so I used slanted text for the author and title to produce a tight, triangular composition that didn’t lead the eye off the image. And here is the complete, final cover. 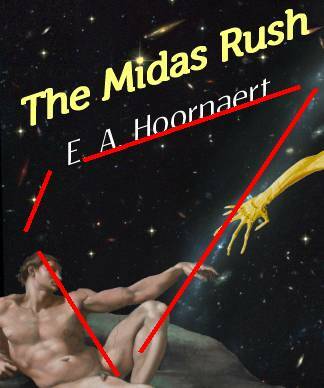 The The Midas Rush will be available on Amazon.com on March 9 to coincide with the annual Tucson Festival of Books, one of the largest book festivals in the country. Last year over 100,000 people and 450 authors attended. Mr. Valentine will be speaking on a couple of panels and also autographing books. See you there! Alright, I like the visional, it very intriguing. March 9th isn’t that far way, marking my calarendar. I remember the tease you had and I do want to know what happens next. I have March 9 circled on my calendar, too. I appreciate the encouragement! Very evocative cover, Ed! Sounds like a great read, too. Happily, March 9th is just around the corner. Thanks for the interest, Samantha!